Dominion Gallery, Montreal (acquired from the artist, 1957). Acquired from the above by the late owner, 1958. 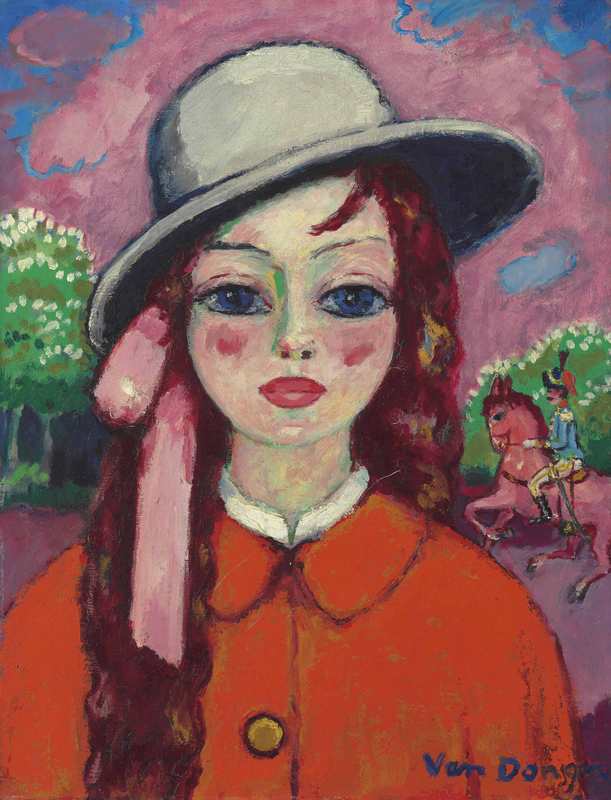 Fillette au bois, Le petit cheval rose is a vibrant portrait by Van Dongen that puts on display his mastery as a colorist. The present work belongs to an extensive series, begun early in his career, of exquisite portraits Van Dongen painted of women wearing extravagant hats; some of these women were drawn from Montmartre's pleasure halls, others from the more sophisticated world of the upper echelons of Paris' bourgeoisie. Here, Van Dongen depicts a charming young girl whose simple jacket, wide-brimmed hat and hair bow suggest that she belongs to this latter, more respectable group. Van Dongen's residence between 1915 and 1921 was the Villa Saïd in the Bois de Boulogne, before going on to purchase an even grander home in the Bois de Clichy. Subjects from the park had occupied Van Dongen since his Fauve years around 1905 and with his move to the Villa Saïd he found inspiration ever closer at hand. At the same time, his art was enjoying wider success with his transition from avant-gardiste to society darling well under way. This transition is reflected in the present work where the more salacious topics of the early Bois de Boulogne pictures are now replaced by a scene of unambiguous bourgeois leisure. Here, a young, respectable girl, models for the artist in the park, with a horse and rider marching past her in the background. The style of Van Dongen's portraits is very identifiably his own, his models distinguished, as in Fillette au bois, Le petit cheval rose, by their large, boldly outlined, wide-set eyes, delicate mouths and luminous skin. While the palette recalls the artist's earlier treatment of this theme, the present painting is clearly a later treatment of the subject. Though he has tempered his street-life imagery, creating a seemingly innocuous scene set in a park. Van Dongen is recognized as a masterful manipulator of paint and an accomplished colorist and this is very much demonstrated in Fillette au bois: Le petit cheval rose. The artist applied his colors--multiple hues of blue, red and green--straight from tube to the picture, mixing them right on the board, adding generous smears of lead white to form the face. The opposition in the face of white and pink flesh with green shadow became a trademark Fauve color effect. Van Dongen's use of green and yellow to provide contour and shadow to the girl's face and neck recalls Matisse's celebrated Portrait de Madame Matisse (Statens Museum for Kunst, Copenhagen, 1905), also known as La raie verte, but in Van Dongen's hands this usage of green is much more subtle. As Van Dongen himself remarked of his post-Fauve work, "there was less colour, but it felt better" (quoted in N. Bondil and J.M. Bouhours, eds., Van Dongen, exh. cat., Montreal and elsewhere, 2008, p. 37).